"Let me be that I am, and seek not to alter me." 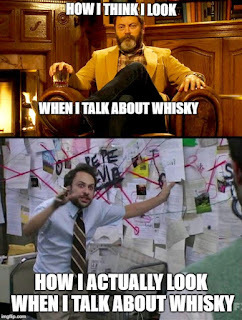 Scotch drinkers are a curious bunch. From the highly specific and odd vocabulary used to describe their drink of choice (cigar ash? carbolic soap? smoked kippers, anyone?) to their strong opinions on caramel colouring, "malt-heads" can come across as fickle, fussy, and some might say downright pretentious. But these discriminating tastes and expectations are reserved for pricey single malts, right? Changing the formulation of an inexpensive blended scotch could never cause dissension in the scotch whisky community, right? 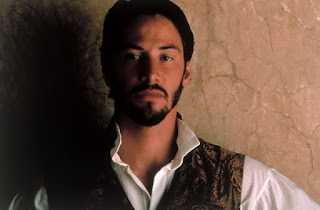 It appears as though an inexpensive blend CAN be as conniving as a Shakespearean antagonist. To some, the "new" Black Bottle is the scotch equivalent of Don John; intent on ruining the happiness, not of Hero and Claudio, but of those who loved the previous, peat-rich version of this dram. Full disclosure: I never tasted the previous, smoke and peat-rich version of Black Bottle. I will be judging this blend on its own merits. Hopefully the more experienced scotch-sippers will not think me a starry-eyed Claudio. Alright, enough with the Shakespeare already ! Gordon Graham's Black Bottle is an intriguing blended whisky. It claims to be "smooth, rich and slightly smoky". We'll get to those claims in a moment. 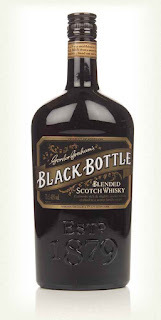 For the 2013 bottling, owners Burn Stewart elected to return the brand to its 1879 roots, complete with a return to the "old style" black bottle. This is the reason, according to the fine people over at The Whisky Exchange, that there is less of a focus on peated Islay whiskies in the blend. Some of the critics claim that Burn Stewart could no longer afford to keep Islay malts in the blend while keeping the price of Black Bottle down. I don't work for Burn Stewart, so I shan't speculate on the matter. Finish: more caramel, oak, a touch of cinnamon and lingering nuttiness, maybe a hint of saltiness. When consumed neat, I did not find this whisky "slightly smoky". I could not find any peat or smoke in this blend until I diluted it with water. I did not find it overly biting or spicy, though adding water brought out some spice. I would place this scotch firmly in the "sweet" category, appropriate for an after-dinner drink. That said, this is a great value for the money. While it's not the most complex blend I've ever tried, it is inexpensive yet does not taste cheap. It tastes young (which it is), but that's not unusual for a blend in this price range. This scotch is very smooth and easy to drink. Be warned: you're wandering into a minefield if you ask blend-loving malt-heads what they think of this new Black Bottle. Some are still irate that the peat and smoke are gone from the "new" version, though this version is now in its fourth year, so it isn't all that new. With Islay Mist 8 Year Old residing in the same price range as Black Bottle, I fail to see how this newer, less peaty version is a problem. If you want a budget blend with smoke and peat, get some Islay Mist 8. Judging Black Bottle on its own merits, I award this wallet-friendly blend a solid two moustaches.